Xiaomi has launched Mi Band 3 wearable. The Mi Band 3 has a bigger, higher resolution OLED screen than the previous model, the Mi Band 2, and Xiaomi says it's more comfortable on the wrist. The company claims the same 20 days of battery life, but water resistance has been upgraded to 50 meters. 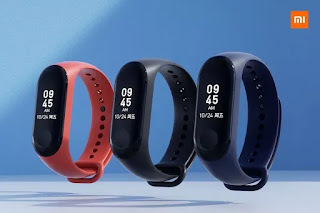 Xiaomi Mi Band 3 comes in Black color with bands in graphite black, hot orange and deep blue colors and is priced at 169 yuan. It will be available in China from June 5th. There is also NFC-enabled version with support for contact-less payments for 199 yuan which will be available in September.